Bramell, Party of Five: Age two, going on ten. Age two, going on ten. 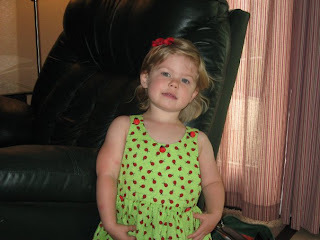 This is a darling little dress that Lee's sister, Dee, made for Becca. We love it because she made it, and because it has ladybugs on it. Oh my goodness! I know I say this everytime, but she is such a big girl! Wow! Precious!